Last night the Constitution was, we hope only temporarily defeated by the “security at any cost” surveillance state when, in a close vote, 94 establishment Republicans teamed with 111 Democrats to defeat Rep. Justin Amash’s amendment to H.R. 2397, Department of Defense appropriations bill for fiscal year 2014. 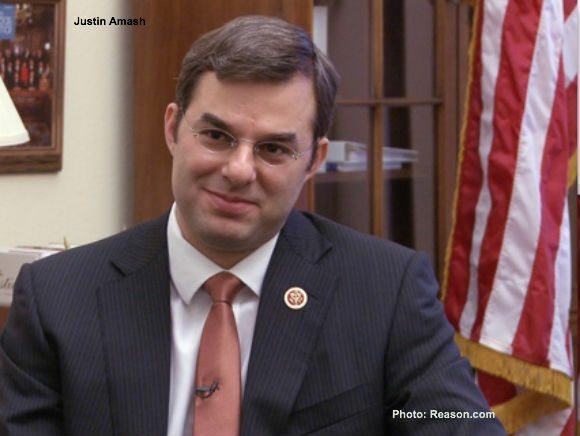 Amash’s amendment to the Department of Defense Appropriations Act of 2014 would have limited the National Security Agency’s use of taxpayer funds under the Foreign Intelligence Surveillance Act (FISA). This would have effectively prohibited the NSA from spending money collecting the phone records of anyone who is not an actually target of a national security investigation authorized by the Foreign Intelligence Surveillance Court (FISC). “The astonishing amount of information the government is secretly seizing from Americans should shock anyone who has even a passing interest in privacy, civil liberties, or the Constitution,” said Amash. However, it apparently did not shock the House Republican leadership enough to cause them to defend constitutional principles against the demands of the voracious security apparatus President Obama is constructing with their now active support. Almost to a man, and woman, the House Republican leadership, and those who aspire to join it, voted against the Amash amendment. That House Intelligence Committee Chairman Mike Rogers and House Armed Services Committee Chairman Buck McKeon would vote against the amendment was no surprise – they long ago bought into the fantasy that just because we have the technical capability of invading the privacy of every American doing so will contribute to our security. But when Speaker John Boehner took the highly unusual step of voting – in this case against the Amash amendment – many otherwise solid conservatives, including practically all the Committee Chairmen and top members of the “A Committees,” followed the leader. With a “majority of the Majority” clearly disposed in favor of the Amash amendment Boehner’s highly unusual step would appear to be a violation of the so-called Hastert Rule and his commitment not to move major legislation against the wishes of a majority of the House Republican Conference. Among those otherwise reliable conservatives voting with Boehner were Michele Bachmann, who sits on the Intelligence Committee, House Judiciary Committee stalwart Lamar Smith of Texas, rising star Tom Cotton of Arkansas and a good number of the leading members of Tea Party wave class of 2010. Among the leading Republicans to vote in favor of the Amash amendment were Marsha Blackburn, Vice Chair of the House Energy and Commerce Committee, Ted Poe, Chairman of the House Committee on Foreign Affairs Subcommittee on Terrorism, Nonproliferation and Trade, rising conservative stars Trey Gowdy of South Carolina and Ron DeSantis of Florida, Mick Mulvaney of South Carolina and Jim Bridenstine of Oklahoma, Republican Study Committee Chairman Steve Scalise and immediate past RSC Chairman Jim Jordan, and of course the tireless band of House conservative “boat rockers” led by Amash and including Tim Huelskamp, Tom Massie, Trey Radel, Steve Stockman and other principled limited government constitutional conservatives. The great benefit of Amash’s amendment, even in defeat, was that it put every Member of the House on the record with regard to the Obama NSA’s overreach. Amash’s amendment may have failed last night, but the debate is far from over, and now we know where to go to find the few votes we need to pass similar legislation in the future – and which Republicans are so weak on the Constitution they may be ripe for a primary challenge. For the complete roll call vote and Republican list of shame click here. Submitted by Julian Alien on Thu, 07/25/2013 - 18:45. These are exactly the people that killed the republican brand for the average American. With Justin's bill being popular with anyone with half a brain or more, these stalwarts to a time when water lines were made of lead continue to embarrass the rest of their representatives. The opposing party agreed with the Republicans, and they snubbed one of their own on this one folks! If you owned a restaurant, and one of your employees throws a pie in a random customers face every time a Volkswagen drove by, would you keep him on because he was working there before you bought the restaurant? Fascism is alive and well in the house of reps! Submitted by lungshot on Thu, 07/25/2013 - 09:15. Some say the bipartisan alliance between Pelosi and Bachmann over this issue is surprising. I say B.S. Those two are mongrel daughters from same b*tch named "Tyranny".